With spring on the way, I felt like a DIY would be super fun way to summon the warm weather. I actually made these and photographed them a while ago but felt I should share. Galaxy is one of my absolute favorite patterns but, with a few exceptions, it is difficult for me to find galaxy pattern that I really like. Thus, my solution was simply to make my own. After a bit of research and surfing through loads of images I had an idea of what I wanted my galaxy pattern to look like. 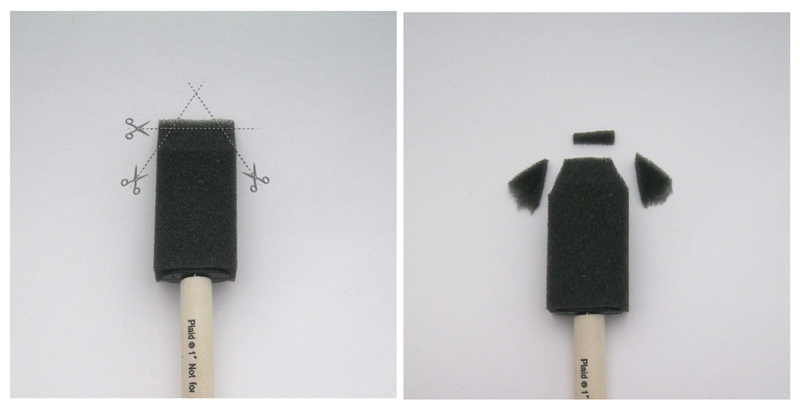 One of the really great things about this DIY project is you don't need any sort of refined artistic talent. Once you know I could of basic tips and techniques it's really easy to create a galaxy pattern to be proud of! 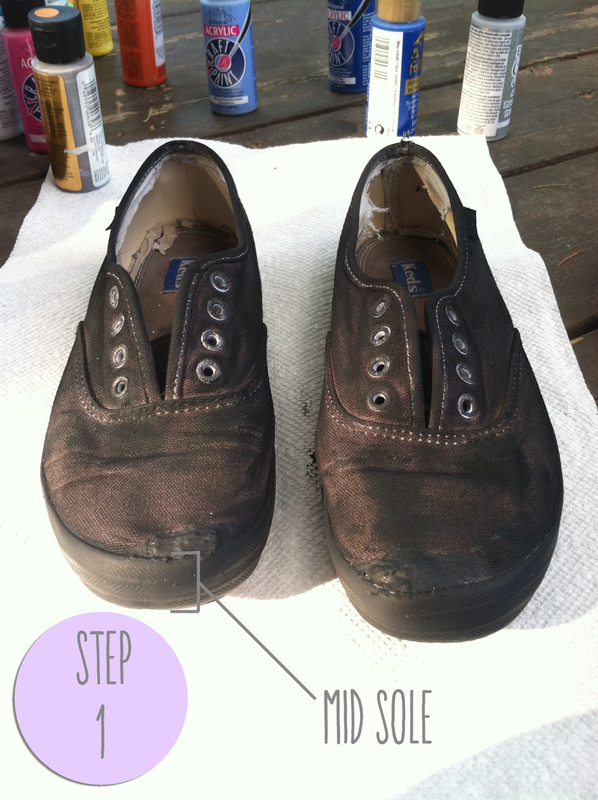 For this project I used a tattered old pair of shoes and inexpensive tools and materials. Things not photographed that you'll need: the little paintbrushes I mentioned above, the shoes (obviously) - I used a torn up old pair of keds, some paper towels, and maybe some cardboard and newspaper (depending on where you're doing this at). The shoes I chose were in very sad condition. So much so that there were holes along the edge of the sole and on the toe. To begin the process I fixed the holes and such using some Shoe Goo. Here they are... all prepped and ready for painting. Take note of the paper towels under the shoes to keep me from permanently painting my deck (: always protect whatever surface you are working on when using anything that can permanently mark or ruin it. See those toes? yeah... those were holes and yes these are highly worn & well loved shoes. 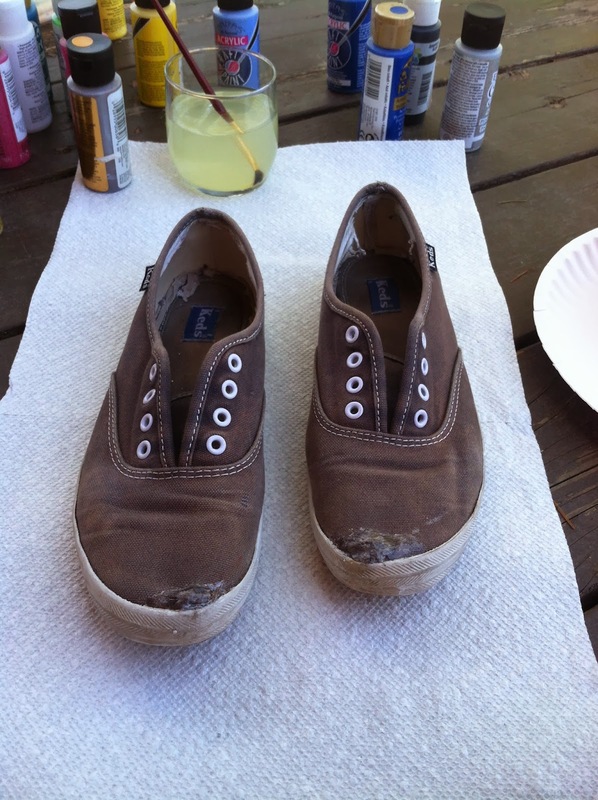 In fact, they were being used as gardening/ 'I need to run out of the house real fast and don't care what I look like' shoes before they were committed to being painted. Before we start painting, it will be a lot easier if you have a clear idea of what each color/set of colors is going to be used for. -The first color, or set of colors if you prefer, is the background or base. For this I used black but you could use navy blue, dark purple, or whatever you feel would suit the rest of the colors you choose. -Next are the cosmos colors is the next set. These are the colors that will make up most of the majority of the color you will see. 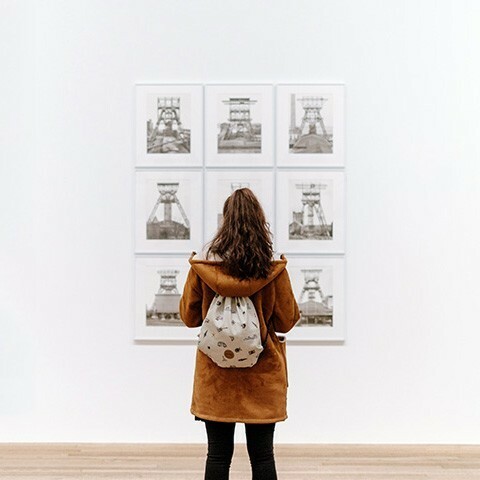 There are loads of different colors you could choose and if you want some great inspiration search for 'false color space' images. Okay now that we have that out of the way we are ready to begin the painting. The first step of the painting process is to create a base layer of color that will serve as the background color. Now not everyone will need/want to do this step. If you are using black or very dark colored shoes you may be able to skip this step. You may choose to include the mid sole in the pattern or not. If you would like to leave the mid sole out of the pattern you can just tape off the sole using painters tape (or even masking tape, it wont hurt the shoe). If you do choose to include soles in the pattern I would suggest doing the background color step as it is chance to make the whole shoe the same color. 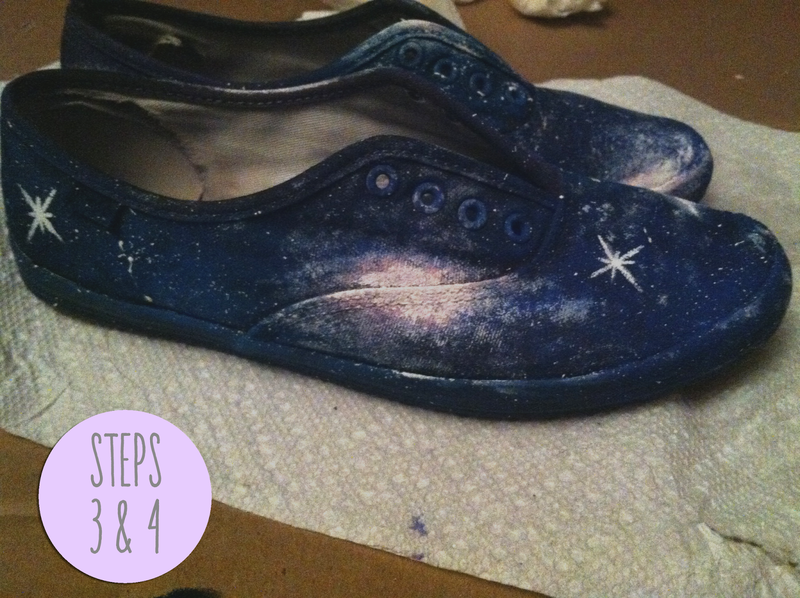 -Note- if you choose not to paint a base layer then whatever the color of your shoes will be base of the galaxy. This will be your 'deep space' color. Here's what mine looked like after the using black as a base coat. Also, my apologies for the quality of this and the next few pictures - the sun was going down and the lighting was quite bad. 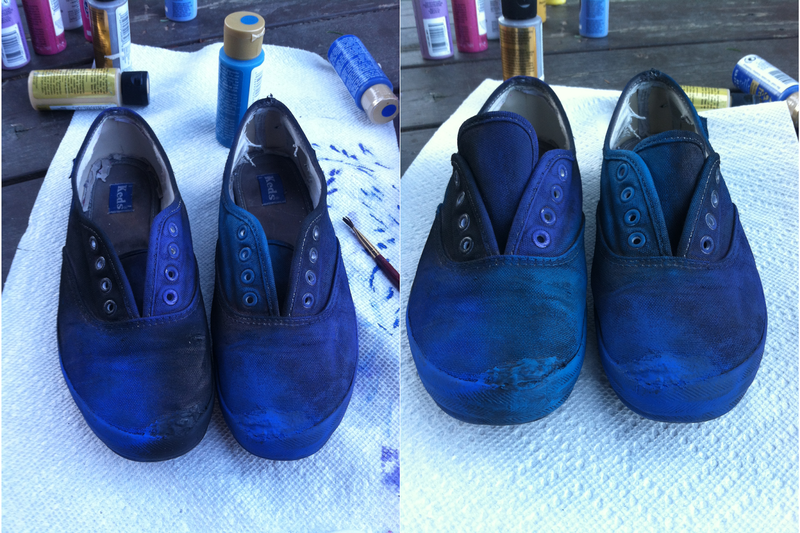 As you can see I painted the entire shoe, including the eyelets, with a somewhat blotchy coat of black paint. I thought that the unevenness may actually add to the depth of the galaxy pattern. For this I used a small soft paintbrush and simply brushed the paint on in sort of messy strokes. Using the same brush I covered the mid sole with a more complete and even coat of paint as the mid sole of my shoes were patterned and filling it in completely looked much better. I had initially intended to leave the mid sole out of the pattern, but I found it a bit difficult to tape around the sole of my shoe. So I figured what the heck, I'll include it (: With other shoes you may not have this issue. After letting the base layer dry we are ready to move onto step 2 of the process, doing the cosmos colors. The best tool I found for this is a crumpled paper towel dipped in a tiny bit paint. A crumpled up paper towel works perfectly because it is an uneven texture that lets you get a more random blotching effect. I also used the small paintbrush from earlier (after washing it out, of course) to paint the eyelets with the cosmos colors because the paper towel didn't work so well for that. The colors I used were cool toned purples, blues, and a blue-turquoise color. I intentionally left portions of the black showing, again to help with depth. The above image shows them with just a couple layers of cosmos colors. Below you see them with a few more layers. By the end I used 4 colors and for some of them I didn't wait for the previous layer to dry completely before applying another so that I got some mixing of color. 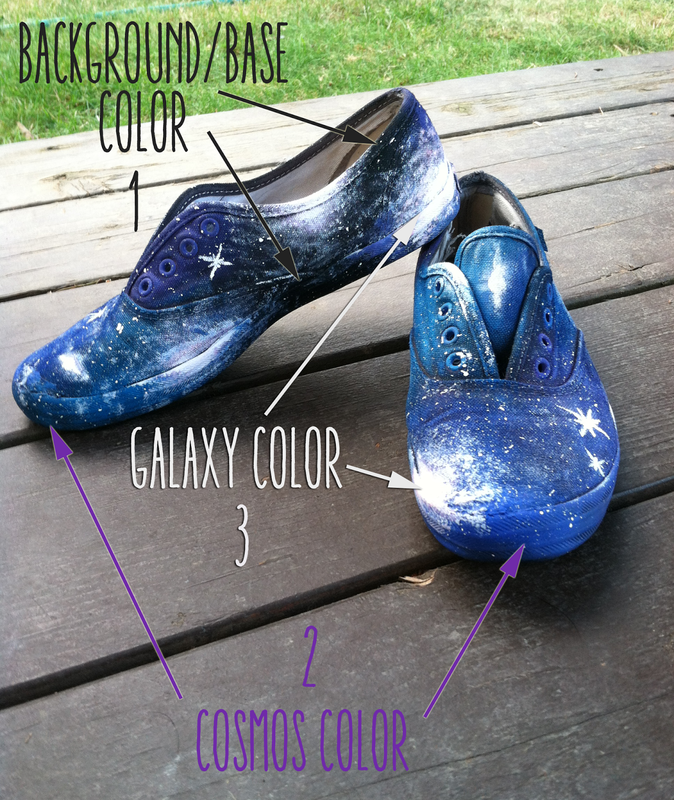 The photo above on the right shows what my shoes looked like when I felt like I had done enough if the cosmos color was ready to move onto the galaxy colors and the fun little details. Shortly after finishing this step I had to run some errands and when I got back the sun had been down for quite some time so I moved my project indoors (this is where the cardboard came in handy). After moving my project inside I promptly forgot to take any pictures of the next two steps. But they are pretty simple and nearly foolproof. 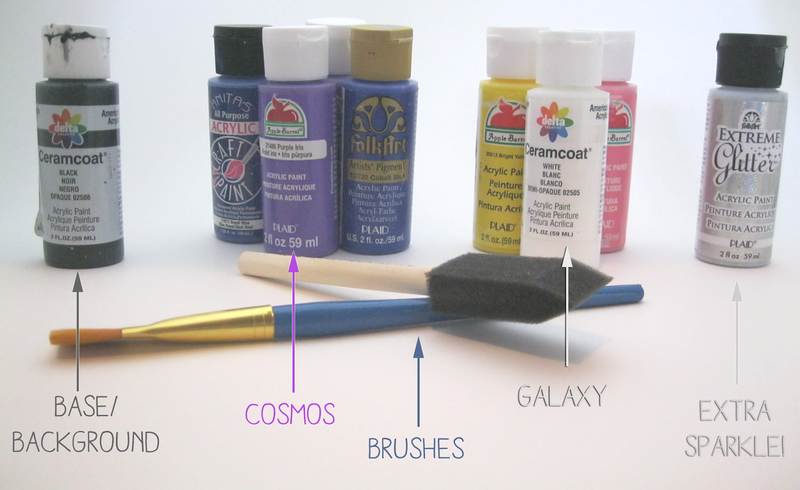 After your cosmos colors are dry is it time to add the background stars. This step and the next step are probably pretty interchangeable, this is just the order I did it in. Also, this step can be pretty messy so be prepared! Make sure you have something like cardboard and newspaper underneath your shoes to protect whatever surface you are working on. 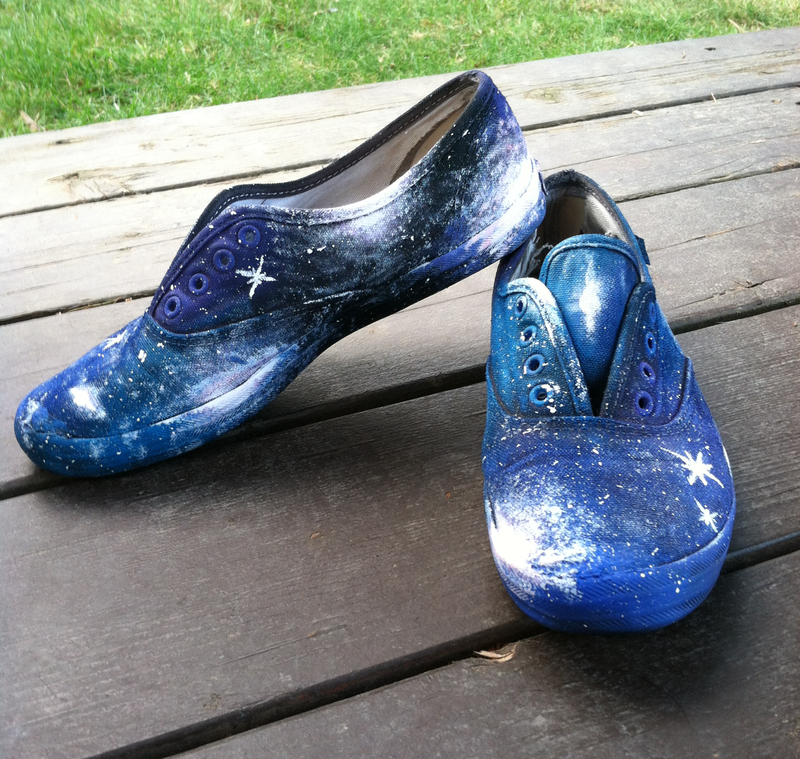 I have found that the best way to get stars is splatter the paint onto the shoes. At first I attempted to do this with a stiff paintbrush. You know one of those big ones used by children for arts and crafts projects? 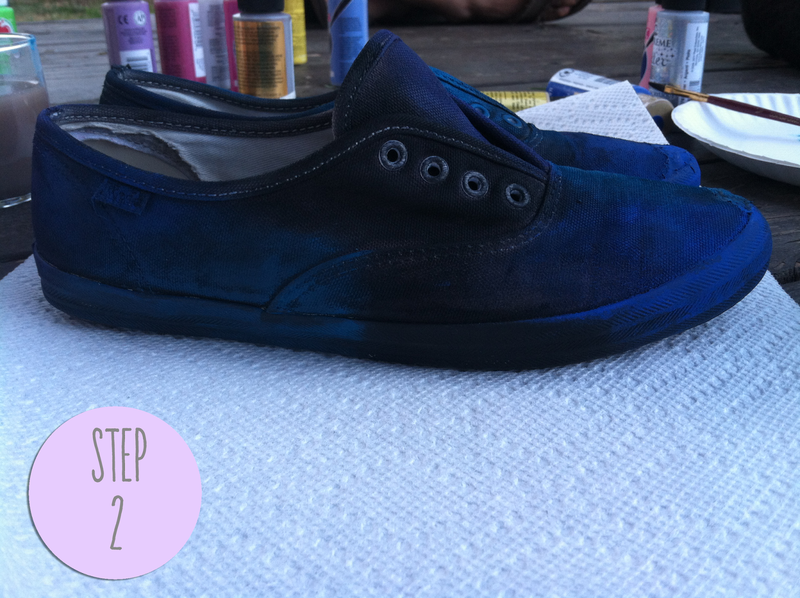 I dipped the tip of the brush in white paint and used my fingers to flick the paint onto the shoes. Eventually, I was just using my fingers dipped in paint to splatter the paint and that was quite a bit easier (messy but easier). Once the background stars have dried you can move onto the 4th and final step, adding galaxies and the pretty sparkly type stars. For the galaxies I used one of the small sponge brushes that I modified slightly and for the twinkling stars I just used a small fine tip paintbrush. To make the galaxies I first cut the corners off of the sponge brush to eliminate the harsh lines it would leave otherwise. It only takes a second to do and really helps to create nice looking galaxy shapes easily. Then using a tiny bit of paint each time, I dabbed small amounts of paint in small areas concentrating the color in the middle of where I wanted the galaxies to be. I started with the 'darkest' of the galaxy colors which was pink. After dabbing the pink on in the shape I wanted I then went over that will a little bit of yellow then finally with white. Galaxies come in all shapes and sizes and if your stuck just search for 'galaxy shapes' and you should find plenty of inspiration. Finally, the twinkly stars! Super easy and I thought they added a great touch to the final product. All you need to make them is a fine tip brush and a little white paint. Then simply make small stars. I always start with a little plus sign shape (+) and then make a small 'X' through the middle. I always try to make the tips of star the lightest while concentrating the paint in the middle of the star. It'll be easier if you practice a couple time before trying it on the shoes. Extra Sparkle - for this I just added a little glitter paint pretty much wherever I wanted. Over galaxies, stars, and just in random areas. Also most glitter paints will look opaque when wet and dry clear with sparkles, so if you are going to use glitter paint test it so you know how it's going to dry. I was so thrilled with they way these turned out! Remember those holes in the toes that I filled in the beginning? Go ahead, scroll back up and check them out... I'll wait. You can hardly see them now, right?! 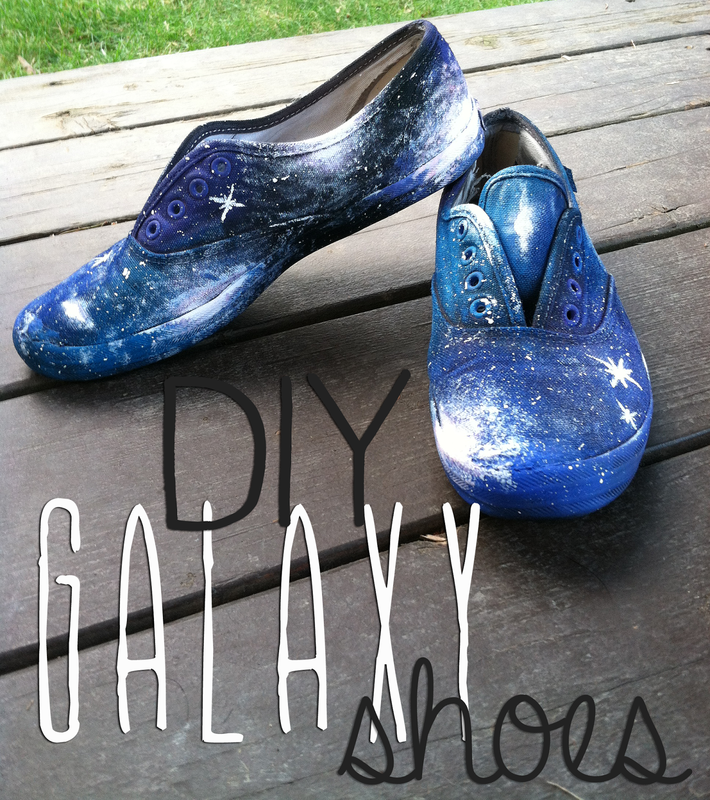 Have you made anything with galaxy pattern? Let me know down below, I would love to see! I bought a pair of ugg shoes for my boyfriend at this online store.Replica Breitling watches The quality is very good, the style of sports shoes is very like,Replica Breitling superocean watches it is very worth buying, there are many famous designer brand replicas ugg, we are sure that it has high quality and appearance. The store has been solving problems for me, the service is very patient, and it is a perfect shopping.replica rolex watch uk When I received this watch, I thought it was a good replica watch. replica rolex gmt master ii watch I like this online store, this watch is simple and generous. Very satisfied with this purchase.